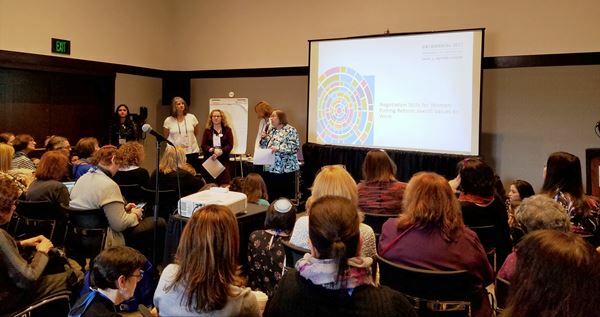 During the 2017 URJ Biennial in Boston the WRN offered several opportunities for its members to come together. There was a fun and casual dinner at 5 Napkin Burger near the convention center on Thursday, December 7. Dinner participants enjoyed delicious vegetarian, vegan and fish menu options. On Friday, December 8 WRN and Women of Reform Judaism (WRJ) came together for T'filah with Cantor Jill Abramson, Karen Goldberg, Rabbi Amy Memis-Foler, and Deborah Radin. Kolot Nashim: Women's Voices in Prayer was a special morning service that highlighted the voices of women in prayers, poetry and song. We were honored to have Lesley Sachs, Executive Director of Women of the Wall, and Anat Hoffman, Chair of Women of the Wall and Executive Director of the Israel Religious Action Center, as well as Rabbi Marla Feldman, Executive Director of Women of Reform Judaism, and Rabbi Mary Zamore, Executive Director of the Women's Rabbinic Network, participate with us and help to lead our morning prayers. The WRN also co-sponsored two reform pay equity sessions with WRJ. On Wednesday, December 6 there was Gender Justice: Women and the Workplace (Strengthening Congregations) with Rabbi Janet Offel, Martha Hausman, and Rabbi Mary Zamore. During this learning session, participants discussed the gender wage gap, its causes, and achievable interventions. The Negotiation Skills for Women: Putting Reform Jewish Values to Work (Tikkun Olam) session with Rabbi Marla Feldman, Danna Greenberg, Dr. Nan Langowitz, and Rabbi Mary Zamore was offered on Friday, December 8. Check out photos from the events below!